This easy no bake cookie recipe is wonderful on a warm day - no hot kitchen. This recipe is at least 40 years old and a true winner in my (cook) book. I offer many old fashioned cookie recipes and desserts for you to try above and at the end of the page. Bring the butter, sugar, milk, vanilla and cocoa to a boil for 5 minutes; or when it forms a soft ball when dropped in cold water. Remove from the heat. Add the remaining ingredients and mix well. Drop by tablespoons onto waxed paper. You can also put them in a pan and cut like bars. Add the oatmeal, nuts, coconut and vanilla. 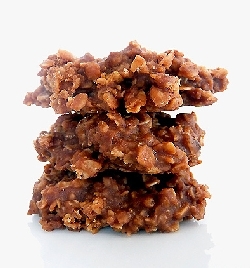 If you have a delicious no-bake cookie recipe you would like to share, please click here. For more of my old fashioned cookie and dessert recipes, just click on the links below.